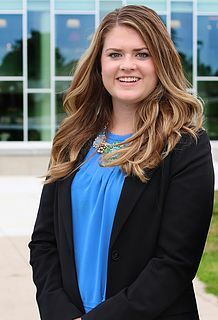 Ferris State University student and PRSSA Chapter President Emma Thibault. Do you see yourself strolling the streets of New York? Residing in a downtown high-rise? Having the world at your fingertips? Becoming the next Olivia Pope or Samantha Jones? As a profession that’s depicted to be glamorous, demanding and media-driven, public relations opportunities are predominantly offered in metropolitan areas. Students that are living in those areas should definitely take advantage of being surrounded by an abundance of opportunities. As for students that don’t have the luxury of being surrounded by such opportunities, growing your resume and portfolio can be more challenging. I am a student at Ferris State University, which is located in the rural town of Big Rapids, Mich., where the nearest metropolitan area requires a 60 mile daunting drive. Although this (semi) remote location makes the balancing act between school, work life, career development and a social life, more challenging, it is not impossible. Attending school in a rural area is not a death sentence, nor should it be. I learned to make the best of both worlds; I’m able to attend a small-town university, and utilize my resources to the best of my ability. Being a public relations student in a rural area might require more motivation and work-ethic, but it also means we care that much more. Yes, it is possible to intern from the comfort of your own home. If having a traditional internship is not an option, add work experience to your resume by gaining virtual internship experience. A plethora of virtual internships are available for public relations, communications and marketing students. To find virtual internships reference websites such as Internships.com, Experience.com, Her Campus or Intern Queen. If your university is the town’s economic center point, chances are many on-campus job opportunities are available for students. Working on-campus can add noteworthy experience to your resume. This proves that you can sufficiently represent and work for an institution. To learn more about on-campus positions speak to your professors, adviser or the Dean’s office. Creating and maintaining a personal brand, website and blog is practically a full-time job. The benefits of maintaining these platforms will prove to employers your level of dedication, professionalism and creativity. Create a personal brand that’s unique and separates you from the average student. Use website creation sites such as Wix, Weebly, Squarespace or Jimdo to grow your personal brand. Being a PRSSA member is exemplary. Take advantage of your PRSSA membership by familiarizing yourself with the multiple membership benefits, including access to the PRSSA Internship Center. The Internship Center provides PRSSA members with instant and exclusive access to a multitude of global internship opportunities. Additional membership benefits can help students add depth to their resume and portfolio. A three month break from class is the perfect timeframe to gain internship experience anywhere you’d like! Not attending classes means you are not restricted to a certain geographical location. Go out of your comfort zone and explore new cities with a stellar internship over summer break. In some circumstances local businesses and non-profits may not offer existing internships. However, this does not mean that you cannot lend a helping hand (at the employer’s discretion). Especially in small-sized, need-based businesses, employers will appreciate as much help as possible. Offering your assistance will prove your work-ethic and passion. This can potentially lead to a position being created just for you, extensive volunteer hours and an exceptional letter of recommendation. Emma Thibault is a junior public relations major, digital marketing and integrated marketing techniques minor at Ferris State University. Her university is located in the rural town of Big Rapids, Mich. She is the president of the Ferris State Chapter of PRSSA. You can connect with Emma on Twitter @EmsThibault.